Dv8 Leather is the home of the Original Razorback 4 mm buffalo leather vest , our Instagram page has examples of this style. 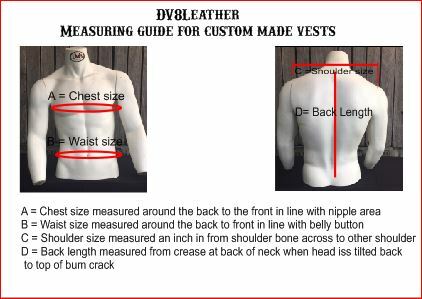 Every Custom razorback vest is handmade to your individual sizing so please measure yourself carefully as we make an individual pattern from the sizes you select in the main menu page . Please allow approx 6-8 weeks from time of order for us to manufacture. Buckle choices are a Dull Nickle plated solid Brass buckle or Polished brass - You need to type this selection into the message us box , Paisley printed bandanna style lining is included in this style of waistcoat Shown with Red - Black combination . Shoulder size - Measured across the back of neck shoulder to shoulder ** Please note to allow one inch inside either side for clearance , so if your outside shoulder size is 18.5 " you would select - 2" = 16.5" ** this is important to prevent catching on objects when you walk past.